Root canal therapy (also called endodontic treatment) is a procedure used to save a tooth in which the nerve has become infected or inflamed due to extensive decay, disease or injury. When the nerve becomes diseased or inflamed, this can result in toothache. We try to save the infected natural tooth when possible rather than removing it and replacing it as it will generally function and feel better than an artificial tooth. Root canal therapy is highly successful when done correctly and when the tooth is reinforced with a crown after the treatment is complete. However, there is a small percentage of cases that do not respond to the treatment or cannot be saved with root canal therapy (in cases where the tooth has internal cracks or microscopic accessory nerve canals) and the tooth needs to be extracted. A small hole is drilled into the top of the tooth to gain access to the nerve chamber. The nerve contents are removed with special files and then a medication is placed inside the tooth to disinfect, kill any bacteria and clear up any infection. The tooth is sealed with a temporary filling material and this medication is left inside the tooth for a few days/weeks to allow for disinfection and healing. 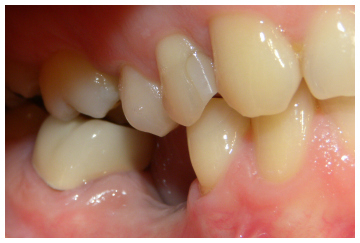 On the second appointment, the tooth is once again made numb and is isolated. The temporary filling is removed, the nerve canal is refiled to ensure all nerve contents and residual medication has been removed and the tooth is re-disinfected. The nerve canal is filled with a specialised rubber material and then a permanent filling is placed. An x-ray is taken to make sure the completed root canal therapy looks ideal. A crown is placed over the tooth to reinforced the tooth and prevent it from breaking down as root canal therapy can leave the tooth weak and prone to breakage.